These classic golf pattern argyle diamond cotton knee socks are a great value and work well for sport or casual dress. The three colors for this pack are - a blue, gray and ivory pattern, a burgundy, gray and black pattern, and a chambray blue, black and red pattern. 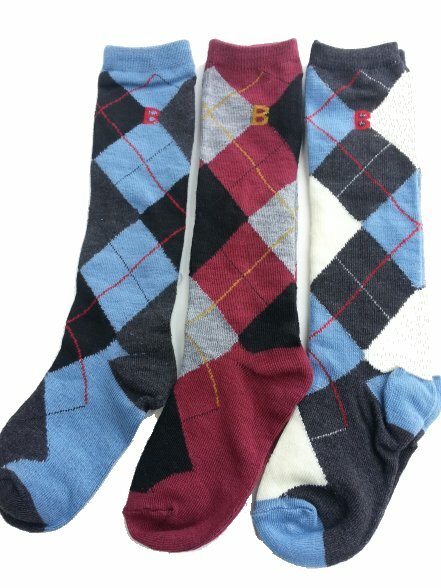 The letter B is at the top of each sock on the inside and outside. Great with shorts or knicker pants. Super old fashioned golf look! One size 6 - 8 socks size ages fits 2 - 6 years approximately. US made design. Ships in 1 business day.